In just a few days, the world will be able to experience both Mario Kart on a handheld, and the DS\'s first ever wide-scale use of its Wi-Fi capacity. Many expect Mario Kart DS to be the killer application for Nintendo\'s handheld, and everyone is eager to see how well Nintendo\'s online service will work. Will it be easy to connect? Will it run lag free? The first two titles to test this system will be Mario Kart DS, due out on November 14th, 2005, and Animal Crossing DS, due out December 5th, 2005. This close to Mario Kart\'s release, review copies and test builds have been making their way to key members of the gaming community, including 1UP.com. 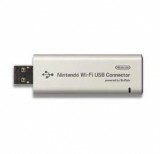 1UP now has an article discussing both Mario Kart\'s Wi-Fi setup and Nintendo\'s soon-to-be available DS Wi-Fi Adapter, which plugs into you Windows-based PC and shares your computer\'s internet connection with your DS. It\'s an interesting read, with pictures of the DS set-up, descriptions of configuring the Nintendo DS Wi-Fi Adapter on your computer, and connecting with Mario Kart. It\'s enough to get us excited about being able to play on the system for ourselves. There\'s been some negative reaction to the DS\'s handling of wireless encryption. The Nintendo DS is capable of logging on and using the common WEP encryption, but incapable of using the much more modern and secure WPA encryption. The lack of WPA encryption makes it impossible for the Nintendo DS to use any wireless network running with this form of encryption enabled. For many of us, that means reverting to an older form of security, one that\'s been shown to be easily hackable, in order to play Mario Kart later this month.